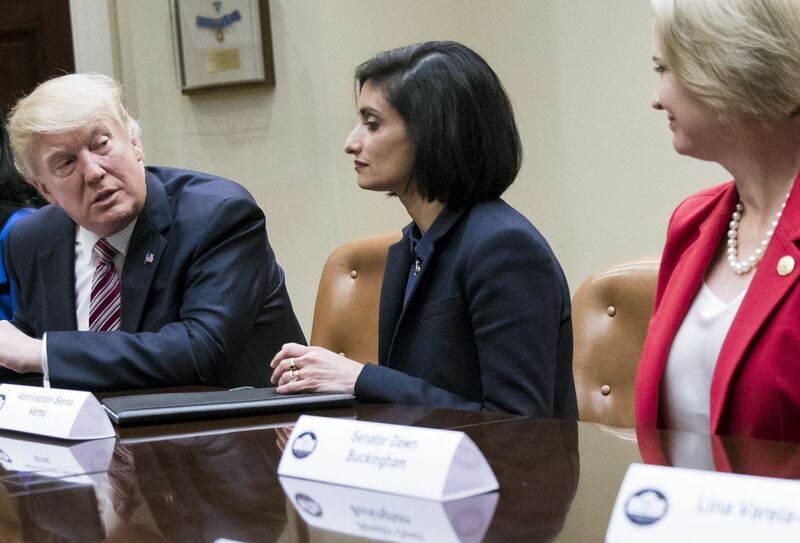 WASHINGTON – The Trump administration issued guidance to states on Thursday that will allow them to compel people to work or prepare for jobs in order to receive Medicaid for the first time in the half- century history of this fundamental safety-net program. The letter to state Medicaid directors opens the door for states to cut off Medicaid benefits to Americans unless they have a job, are in school, are a caregiver or volunteer, or participate in other approved forms of "community engagement" – an idea that some states had broached over the past several years but that the Obama administration had consistently rebuffed. 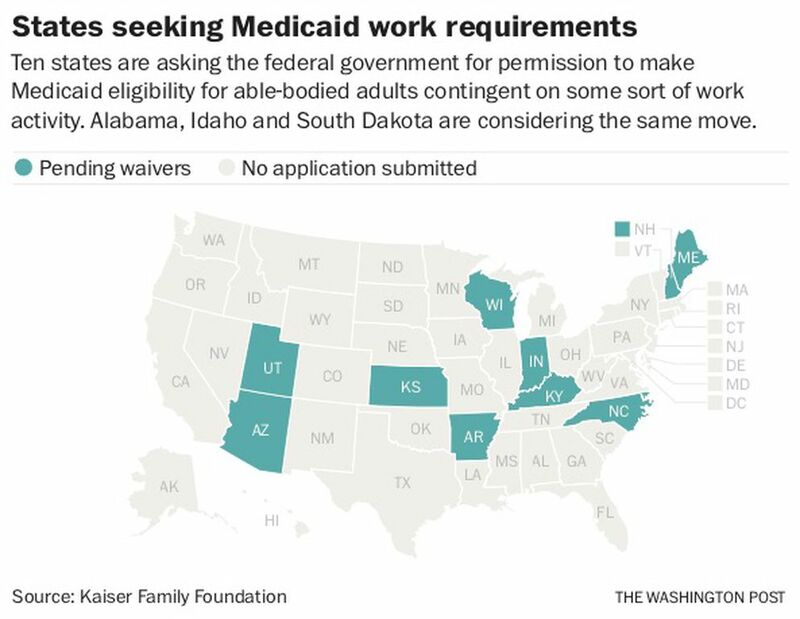 The new policy comes as 10 states are already lined up, waiting for federal permission to impose work requirements on able-bodied adults in the program. Three other states are contemplating them. Health officials could approve the first waiver – probably for Kentucky – as soon as Friday, according to two people with knowledge of the process. "[A] growing body of evidence suggests that targeting certain health determinants, including productive work and community engagement, may improve health outcomes" the letter says. "While high-quality health care is important for an individual's health and well-being, there are many other determinants of health." Cuello said the argument that work promotes health is "totally contorted . . . It's a little like saying that rain causes clouds. It's more that people [with Medicaid] get care, which helps them be healthy and makes them able to work." In a letter Thursday to Brian Neale, the CMS deputy director who oversees Medicaid, the organization said the administration's new policy "entirely ignores the wealth of literature regarding the negative health consequences of work requirements" and was issued without any opportunity for public input. The White House also cited a separate rationale. Asked at Thursday afternoon's briefing whether people are taking advantage of the system, press secretary Sarah Huckabee Sanders replied: "I think there are certainly cases where that happens. . . . [T]hat's an issue and something we want to be sure to address." The CMS guidance gives states a great deal of flexibility to define their own exceptions to a work requirement, as well as what counts toward work. "Each state is different," the letter says, and such activities "include, but are not limited to, community service, caregiving, education, job training, and substance use disorder treatment." The guidance specifies only that pregnant women and "medically frail" people be exempt – though frailty is not defined – and that people with opioid addiction be either exempted or allowed to count time in drug treatment toward work activities. It also suggests that states take into account the local availability of jobs in creating requirements. People receiving TANF cash assistance or SNAP food benefits who meet those programs' work requirements will be considered in compliance with Medicaid's rules. While states should help people on Medicaid meet their requirements – for instance, by helping them find child care, transportation or job training – they may not use any Medicaid funds to do so, the letter says. In the states that adopt such requirements, critics say, the effect will spread far beyond the healthy adults who do not already comply. Those who have a job, are in school or care for young children will need to document to their state's Medicaid agency that they are in compliance – or risk losing their benefits.